A 3D printed man-eating Venus fly trap? We wouldn’t have expected anything less of Alex Friderici, a VFX designer who’s worked on visual effects for dark, surreal movies such as Pan’s Labryinth and Sin City. Bringing together the art of animation and stereolithography 3D printing technology, Alex creates beautiful, yet horrifying zoetropes on his Form 1+ 3D printer. He runs EyelandArts, a visual effects studio based in South Florida. One of the earliest forms of filmmaking, a zoetrope takes a series of objects or drawings that each appear to be in a different stage of motion and spins them around to give the impression of continuous motion. Alex printed the carousel portion of the model for use on a record player or to spin with an additional 3D printed handle. To animate the 3D printed characters, Alex used a strobe light set at the fastest setting and directed it at the moving carousel. The flashes of light create the illusion of movement. Like most designers, Alex went through a few prototypes to arrive at his best models. From the first to the last prototypes, he changed to the scale of the print, the strength and clearance of the handle, the personality of the animated motion, and the record player versions and adapters. 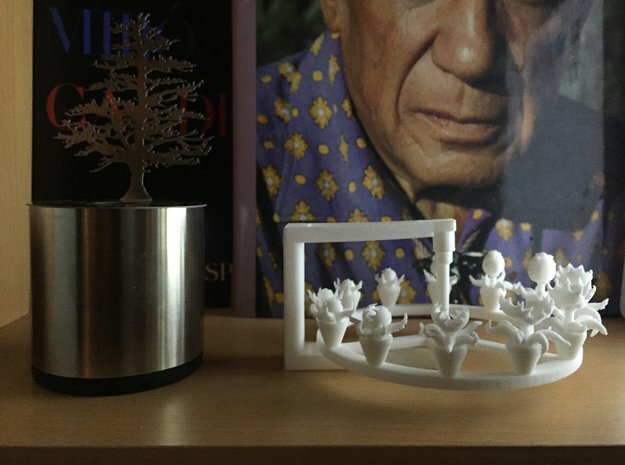 Once he finalized his designs, Alex decided to sell his models through his Shapeways page. For more images and gifs of Alex’s finished models, check out his post on Imgur. Alex spoke to the value of online tutorials, as well as gave us some advice related to the prints themselves. - Make sure its something simple as far as motion since you only have 12 frames to do it and it has to loop back to the beginning. - Some part of your model needs to act as the support for the rest of your model. - Since the space is limited and the figures are quite small, this will help you to use less supports and remove the supports you do add.